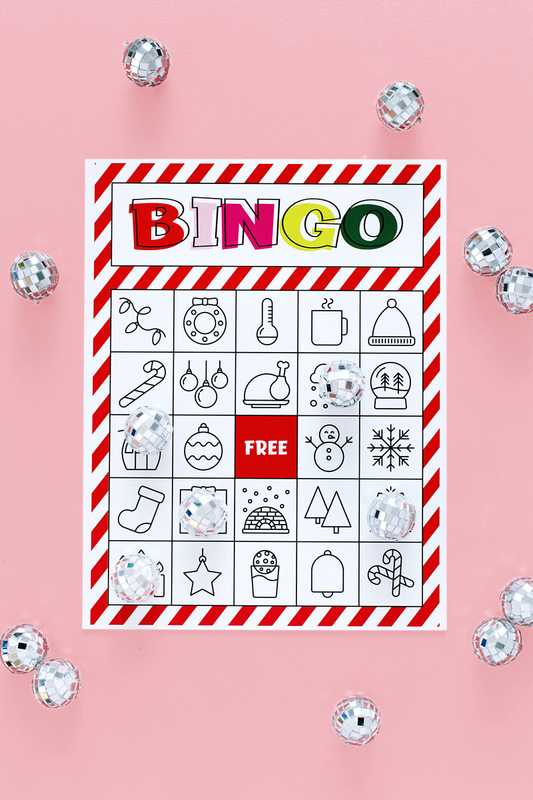 Tis the season of Christmas party games and these free printable Christmas bingo games (download below) will be your ticket to the most fun party yet. Playing bingo is obviously great for large groups making it a party game that everyone loves all season long. Playing Christmas bingo at parties is one of my greatest holiday memories. From the classroom to the family lul that happens after presents are opened, busting out a colorful game of Christmas bingo will be lots of fun for everyone. 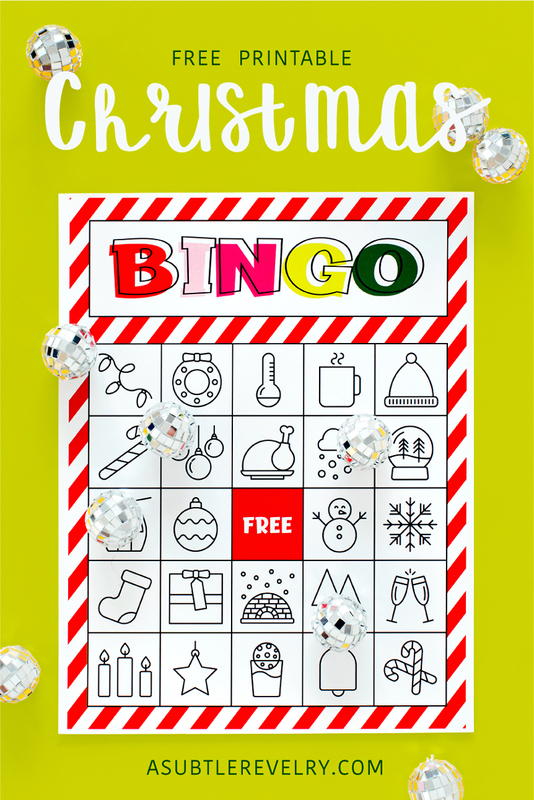 Our free printable Christmas bingo cards – 1 per everyone playing, plus one set to cut up. Bingo markers, I’m a big fan of these miniature disco balls, but you can really use anything. Pennies work great. A hat, bowl or something to put all the pieces in to pick from. Start by printing out our Christmas bingo printable following the instructions below. Check out my notes for adapting the Christmas bingo for large groups. Take the extra set you printed out and cut up all the squares, this doesn’t have to be perfect to work – it should take you under 5 minutes. Place all the squares in your hat or bowl (removing duplicates) and have the game conductor call out the bongo card squares. 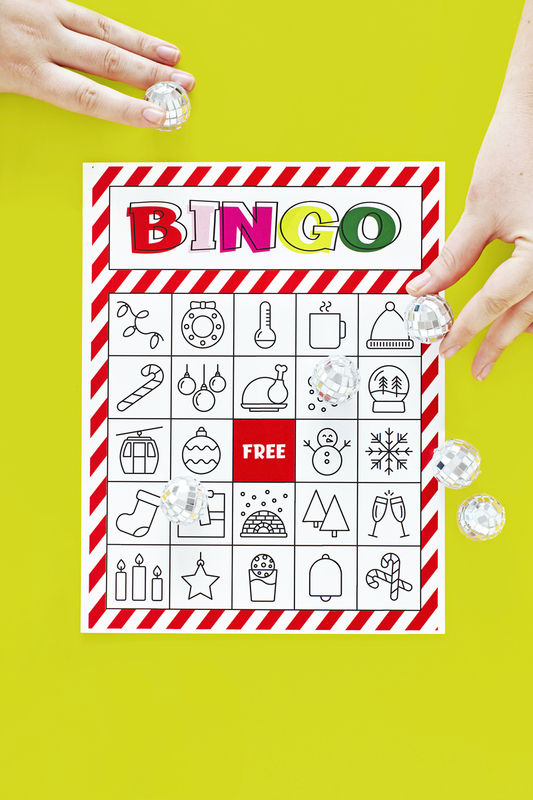 To download our free Christmas bingo printable PDF by clicking right here for the download. The download will open in a new tab as 8 separate printable bingo cards in the file. Simply save to your computer and the bingo cards are now yours! Print at home which is easy to do if you have a color printer. Simply send the PDF to your printer and watch the Christmas fun print out one by one. Send the file online to your local print shop. If you do this, they come out best when selecting full color and a thicker card stock. Pick up when ready for a Christmas bingo game everyone will love. When we are planning for large group Christmas parties it can be a challenge to find enough different Christmas bingo cards to make it work. Whether we are in a classroom or an office needing 30 or up to 50 different Christmas bingo cards for large groups to play correctly. Not to worry – we have you covered! To adapt our Christmas bingo game to work for your large group. follow the directions above to print out enough free printable bingo cards for your large group – one per person. Head to the store and grab and a pad of small Christmas themed stickers, or order these ones from Amazon. Before playing the game, comb through the cards and randomly place the stickers onto spots on the card, just make sure the images DO NOT match. So for instance, put a Santa sticker where there currently is a wreath etc. By doing this, you will ensure each of the cards is different enough. Play with your large group for an easy & fun Christmas game. We’ve used this concept to play with the kids classroom and everyone had a blast! 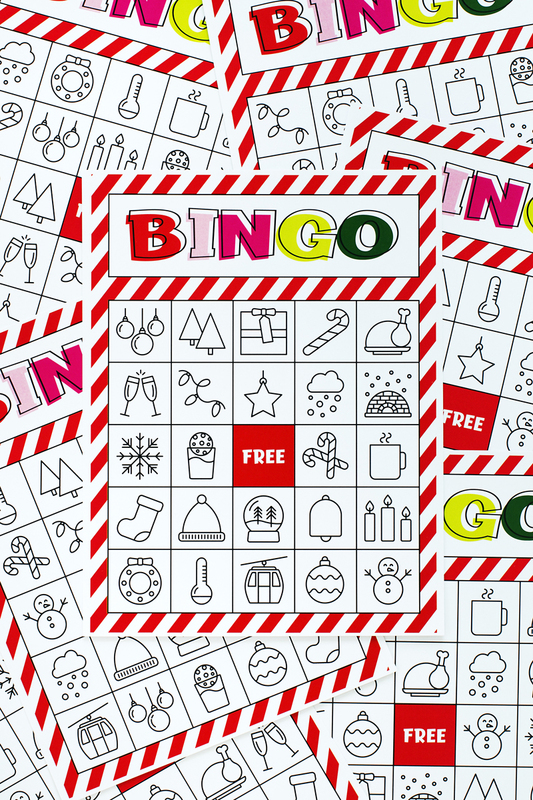 Here’s to hoping our Christmas bingo games are a hit for large groups and small ones too. Omg! These are too cute! I’m downloading these now! Lovely bingo sheets, thank you so much! !